The Golden Guns is the new revamped version of 3D Saloon Slots, it is a slot machine with 3 slot wheels and 3 win lines and wheel locks. 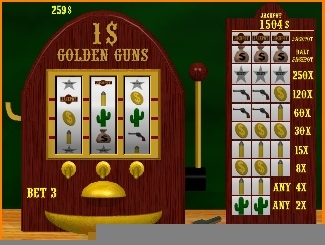 The Golden Guns is a beautifully rendered 3D wooden slot machine (a revamped version of 3D Saloon Slots). Play the slots like they did back in the wild west with this 3 wheel, three payline, two spin slot machine. It even has a wheel lock feature which gives you even more chances to win the progressive jackpot! Do you have what it takes to play The Golden Guns? 3 wheels with wheel lock and 3 paylines.